Smart IoT applications have improved the way we interact and are addressing some of the biggest challenges facing cities and communities: climate change, pollution control, early warning of natural disasters, and saving lives. Businesses are benefiting too, through improvements in operations and efficiencies as well as reduction in costs. This wireless RF technology is being integrated into cars, street lights, manufacturing equipment, home appliances, wearable devices – anything, really. LoRa Technology is making our world a Smart Planet. LoRaWAN is a Low Power Wide Area Network (LPWAN) specification intended for wireless battery operated Things in a regional, national or global network. LoRaWAN targets key requirements of Internet of Things such as secure bi-directional communication, mobility and localization services. The LoRaWAN specification provides seamless interoperability among smart Things without the need of complex local installations and gives back the freedom to the user, developer, businesses enabling the roll out of Internet of Things. Public and private networks using this technology can provide coverage that is greater in range compared to that of existing cellular networks. It is easy to plug into the existing infrastructure and offers a solution to serve battery-operated IoT applications. Semtech builds LoRa Technology into its chipsets. These chipsets are then built into the products offered by our vast network of IoT partners and integrated into LPWANs from mobile network operators worldwide. LoRa is a wireless technology that has been developed to enable low data rate communications to be made over long distances by sensors and actuators for M2M and Internet of Things, IoT applications. 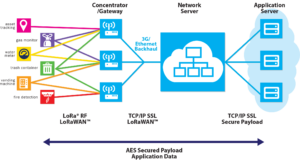 As LoRa technology is able to provide a wide area network capability, it is often referred to as LoRaWAN. LoRaWAN uses star topology as it increases battery lifetime when long-range connectivity is used. LoRa Nodes / End Points: LoRa end points are the sensors or application where sensing and control takes place. These nodes are often placed remotely. Examples, sensors, tracking devices, etc. LoRa gateway : The gateway receives the communications from the LoRa endpoints and then transfers them onto the backhaul system. This part of the LoRa network can be Ethernet, cellular or any other telecommunications link wired or wireless. The gateways are connected to the network server using standard IP connections. On this way the data uses a standard protocol, but can be connected to any telecommunications network, whether public or private. In view of the similarity of a LoRa network to that of a cellular one, LoRa gateways may often be co-located with a cellular base station. In this way they are able to use spare capacity on the backhaul network. Network Servers: The networks server has all the intelligence. It filters the duplicate packets from different gateways, does security check, send ACKs to the gateways. In the end if a packet is intended for an application server, the network server sends the packet to the specific application server.Using this type of network where all gateways can send the same packet to the network server, the need of hand-off or handover is removed. This is useful for asset-tracking application where assets move from one location to another. Remote computer: A remote computer can then control the actions of the endpoints or collect data from them – the LoRa network being almost transparent. In terms of the actual architecture for the LoRa network, the nodes are typically in a star-of-stars topology with gateways forming a transparent bridge. These relay messages between end-devices and a central network server in the backend. Communication to end point nodes is generally bi-directional, but it is also possible to support multicast operation, and this is useful for features such as software upgrades and the like or other mass distribution messages. The LoRa classes include Class A, Class B, Class C used for different functionalities. All the LoRa devices must support Class A operation which is most efficient in terms of power consumption. Bi-directional end-devices(Class A) End-devices of Class A allow for bi-directional communications.Each end-device’s uplink transmission is followed by two short downlink receive windows. The transmission slot scheduled is left to the end-device with a small variation based on a random time basis (ALOHA-type of protocol). LoRa Class A operation provides the lowest power option for end points that only require downlink communication from the server shortly after the end-device has sent an uplink transmission. Downlink communications from the server at any other time wait until the next scheduled uplink time. Bi-directional end-devices with scheduled receive slots (Class B) This class of end devices use extra receive windows during downlink period in addition to two time slots specified in class-A. In order for the End-device to open it receive window at the scheduled time it receives a time synchronized Beacon from the gateway. This allows the server to know when the end-device is listening. Bi-directional end-devices with maximal receive slots (Class C) This class of end devices can listen all the time except in transmit mode. Hence it is ideal for applications requiring more downlink transmissions. Class C LoRa end device will utilize more power compare to Class A and Class B counterparts. It has lowest latency among all the LoRa class end devices for data communication between server and end device. LoRa can play a significant role for providing a smart, low cost and highly efficient network for future applications. It has an association of more than 400 companies globally to contribute, improve and implement smart network for future needs for different area like Smart city, Industrial Area, Health Sector etc. It uses 868 MHz/ 915 MHz ISM bands which is available world wide. It has very wide coverage range about 5 km in urban areas and 15 km in suburban areas. It consumes less power and hence battery will last for longer duration. The modules are cheaper than those of the licensed technologies. No SIM cards are needed. This means that no costs can arise for administering and replacing SIM cards. The infrastructure is still thinly spread. It is still in the process of being developed, and this will take some time. It can be used for applications requiring low data rate i.e. upto about 27 Kbps. LoRaWAN network size is limited based on parameter called as duty cycle. It is defined as percentage of time during which the channel can be occupied. This parameter arises from the regulation as key limiting factor for traffic served in the LoRaWAN network. Tata Communications is in the process of building India’s first Internet of Things (IoT) network in the cities of New Delhi, Mumbai and Bengaluru. The network will allow millions of devices to be connected. Tata Communications claims that its LoRa network is world’s largest with deployment in 38 cities in India which the company plans to expand to cover most of India by 2019-end. With investment planned of USD 100 million in the next couple of years in the IoT segment, Tata Communications is expecting the business to contribute substantially to its revenues going forward. LoRa is regarded as a more ‘open’ technology than LPWAN rivals such as Sigfox and Ingenu, and it has drawn support from companies including Bouygues Telecom , Cisco Systems, IBM and Orange. Tata Communications and Semtech have worked together to deploy 35 IoT proofs-of-concept (PoCs) based on LoRa Technology across these cities. The PoCs cover a wide array of applications, including sensors for remotely monitoring air conditioners and safety deposit boxes, energy management systems used to optimize the use of electricity, gas and water, and multiple smart buildings and smart city applications.